Without an adequate water source a city in ancient times could simply not exist. Settlement in Jerusalem (the Old Ancient Core – later the City of David) developed around the major water source in the area – the Gihon Spring. One water system, known since the mid 19th century, is called Warren’s Shaft or the Jebusite system. It consisted of a diagonal sloping tunnel, about 123 ft. [37 m.] long that ended at a spot where a vertical shaft dropped 36 ft. [11 m.] to a spot where water could be drawn. Recent discoveries near the Gihon Spring have suggested that an alternative system was used at an early period that consisted of the “Diagonal Sloping Tunnel” that led to a pool – rather than Warren’s Shaft – from which water was drawn. For a presentation of Reich's theory, see Reich, Ronny, and Shukron, Eli. 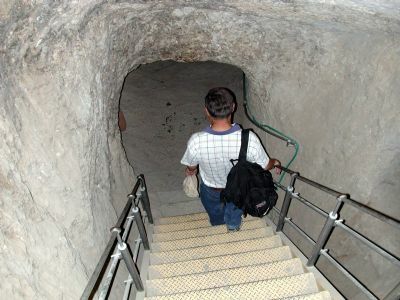 "Light at the End of the Tunnel: Warren's Shaft Theory of David's Conquests Shattered." Biblical Archaeology Review, vol. 25, no. 1 (January/February, 1999):22–33, 72.